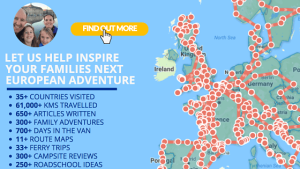 Looking for educational experience tips for families from places around Europe. Find resources or join us as we take our children to see Europe’s amazing educational highlights. Come discover, experience & learn alongside us! Imagine learning about the Cold War by standing inside a sentry’s hut beside the Berlin Wall. Instead of just reading facts and looking at pictures from a textbook, you could tour Krka National Park in Croatia and see firsthand how waterfalls are actually formed. Imagine learning science by taking an adventure-filled kayak safari through a Eidfjord in Norway and studying plant life and animals you encounter rather than those you see in books. Whilst this opportunity is something we’ll treasure forever we realise it’s not everyone choice… but for those that are interested in finding out more about roadschooling. We hope you’ll enjoy what you’ll find on our full European Roadschooling page.. Over 200+ practical resources and even our subject specific lessons plans too..